Our PPC Conversion Scientists have mastered the art of keyword discovery. They use their experience to hunt down low volume keywords (very specific phrases) that are less competitive to advertise. By leveraging this rich search engine experience, we can provide our clients with higher-converting marketing campaigns, and more bang for every dollar that they spend on PPC. Pay-per-click advertising gives you that opening, which you need as a business, to appear in the first position on search engines and on relevant partner websites. PPC allows you to develop your Marketing Strategies or any other Search Engine Optimization efforts with real-time facts and figures, not just assumptions and guesswork. We are an award winning Digital Marketing Company that specializes in Enterprise Level Digital Marketing Strategies . We offer comprehensive PPC Management Solutions (or tweak your existing Pay-per-click campaigns) as well as seamless optimization, such as Adwords Performance Optimization, Google Tag Manager and eCommerce Analytic Integration to measure the ROI, setup your Remarketing, provide in-depth Conversion Audit and super targeted Keyword Research. Whether you are a local startup looking for exposure or an e-commerce platform looking for leads – PPC is definitely the answer to your problems! Click the “Make My Business Fly” button below to get started. Pay-per-click Campaign Management Requires a Tactical Approach and Careful Implementation. From keyword research to strategy development to A/B Split Testing, our professional PPC experts will continuously improve your campaign. Pay-per-click advertising is no more the “Set-and-forget” form of advertising that you could check once in a month. With new businesses entering the PPC territory each day, even a hairline mistake could cost you money that could have otherwise been spent in a more conversion optimized way to generate real leads and traffic for your business. Are You Tapping These PPC Marketing Opportunities Yet? Talk about being atrocious. The last time we tried, one of our Conversion Scientists put the word "Free Shipping" in the advertisement of our clients' who sell digital services. It resulted in a 327% increase in CTR within one week and $14700 in value from only 689 Clicks! With just $800 PPC Spend. Sometimes, it's just not about being logical. Advertisements that stand out and amuse your audience fare better than the repetitive/bland scripts some copywriters write. And this is just one amusing story. The question remains, will your story be next? Pay-per-click Audits are indispensable tools for creating result oriented PPC campaigns. Extreme-SEO PPC Audit will enable businesses of all sizes to review their PPC history and discover critical areas that need immediate attention. Our experts will analyze your PPC Accounts, create a report and then help you understand the mistakes that are preventing your account from becoming a high-performing PPC account. With the PPC Audits, you can identify how stacked up your business is against marketers in the same budget-bracket, what is wrong in your PPC accounts and what can be done to improve performance. Our Google Adwords management service allows you to leverage the Google Search Index to make your voice heard by people that make a difference to your brand, in a cost effective manner. We use the Google's Adwords - to execute a PPC campaign. The way it works is - advertisers use Adwords to bid on "keywords" or "key phrases" that they want to trigger their sponsored ads. Our PPC Experts work with your Adwords PPC account using proprietary software to synchronize your campaigns, write conversion driven copy and optimize your cost per click for every ad-group individually. The Bing Ads Network is a critical marketing opening for most Small and Medium Sized businesses. Bing Ads use a similar dynamic as the Google Adwords Auction, so as an advertiser you have numerous benefits from the absence of competition, cheaper CPC rates and better ads position. Since the customer conversion rates are much higher in this network, our PPC experts can help bring that high value and low-cost audience to your business. We can also import your existing campaigns from Google into your Bing Ads Account and report on your advert performance in intervals. Facebook ads offer an unparalleled level of audience targeting. Out of its 1.5 Billion user base, you can target your advertisements to only those people who will interact with your sponsored ads. You can create advertisements that boost your posts and increase page interaction. Drive clicks to your website, get more activity on your apps, and promote special offers that increase visibility or even get more likes and shares on your page. Unlike other PPC Management services that only focus on sponsored posts, our ads strategy focuses more on Remarketing and News Feeds via the Sidebar. LinkedIn Advertisement campaigns help your business gain more exposure by displaying your advertisements to highly targeted professionals in this B2B network. Advertising on LinkedIn opens your business to millions of marketing opportunities, laying focus on business professionals first and then targeting by keywords with additional features like 'display ads to specific groups' and professionals, Job Title, Location, Job function, Company Size and more. LinkedIn Advertisements offers built-in lead generation by allowing seamless user feedback and follow-ups, directly through the adverts. We provide custom tailored Twitter Ads and #Hashtag synchronizing services to engage your target audience and grow your user base. Our Twitter experts will put their six years of experience into researching your market to identify if you prospects are active on Twitter. Once your target audience is located and locked, we will devise a custom PPC strategy that includes laser focused ad campaigns, which are continuously optimized for lower CPC. The campaigns will drive relevant traffic to your website, stir and engage your targeted audience & spread awareness about your #Hashtags. If your PPC Management Firm is missing any of these, chances are, you are dumping your money into a waste bin! We have saved more than $3.6 Million for our clients till 2015 so far, by just keeping these facts straight. We will spend the time to design a custom PPC Campaign that fits into your business, by understanding your industry, sector, competitors and USP's. Only then will we establish a strategy that is going to fetch the outcome you desire. We will implement the strategies by working on your existing campaigns or building new ones. We will make your accounts in identified networks if you do not have already. We pay careful attention to individual network guidelines. In-depth keyword research with various proprietary and industry-leading tools. Our aim would be to make you cover as much land as possible, without wasting your Spend or treading into areas that your business could do without. Without a good advertisement copy that fails to deliver your pitch to your audience, you have wasted all your money on PPC. Our industry copywriters will write adverts that are clear, concise and incite click-through. It is impossible to split test or even run a successful PPC Campaign without optimization. We activate tracking on all your accounts so that we can collect all the data that will give us critical insights into what needs to be optimized and how. Ad extensions provide extra space to give more details about your advertisement. If used properly, these extensions can serve as an opportunity that stands out from your competition to provide higher exposure. Every PPC Ad needs optimization at the end of the day. The more you tweak an advertisement, the lesser will be your cost per click over time, along with higher conversions. We pay attention to every detail in your campaign. Our reports will provide meaningful insights into what is happening in your PPC advertisement campaign. You will clearly understand your progress since the last report and what your competitors are doing to counter your course. Are You Investing In Mobile Marketing and Regretting? Majority of startups and even established businesses fail to understand the importance of going mobile or investing in re-targeting (a.k.a remarketing). Is your business making the same mistake? It's time to get yourself acquainted with the "Big Daddy" of Advertisement Campaigns. Smartphone usage has overtaken PC and Laptop usage since 2014, which entails that if your business is not mobile-friendly, you are missing out on tons of lead generation opportunities. Since the CPC, Conversion Rate and ROI are different for mobile devices. Our PPC Experts will make important changes and mirror your Desktop Campaigns for Mobile viewing. Mobile Advertisements have a much higher CTR than Desktop Advertisements. Re-targeting Customers, more like the online version of “Constant Nagging"
98% customers do not make a purchase decision on their first visit to your website. This is where Retargeting comes into play. Like the ‘devils' we are, we insert cookies into your website visitors’ computers (legitimately of course), so that where ever they go, your advertisements will follow. Retargeting not only works with Google but also does great with Facebook, Twitter, LinkedIn and Bing. Imagine a salesman in real life, "constantly nudging" your customers and reminding them about your website. It becomes a subconscious pipeline into your customer's brain, till they cannot help but visit your website for whatever they were looking for. For our six years in the Internet Marketing Field, never has a business gone wrong with Retargeting. 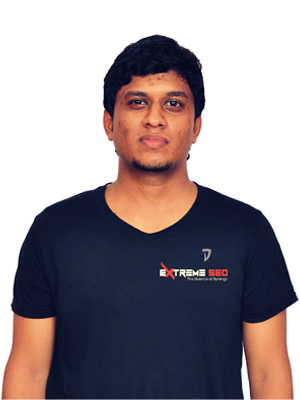 At Extreme-SEO, we don't have a one size fits all approach to PPC Marketing for our clients. 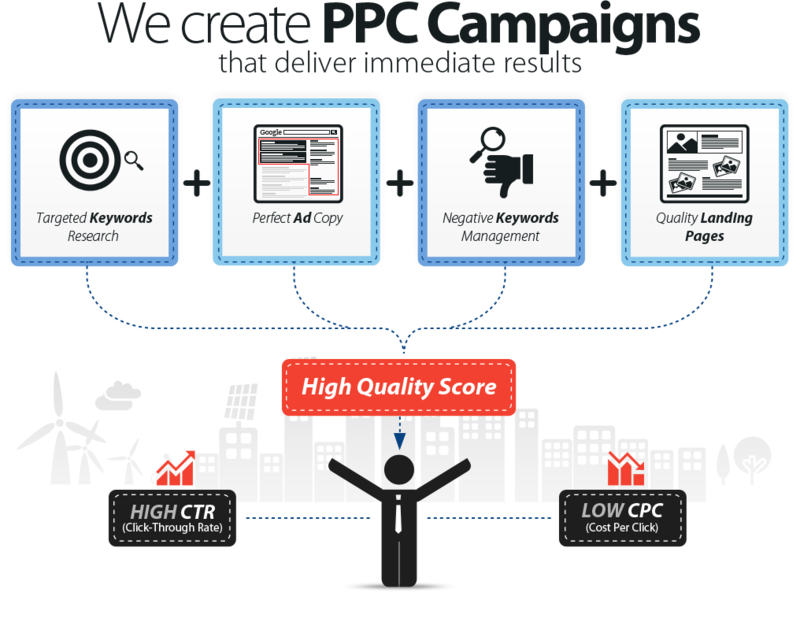 We treat every business individually and customize a PPC campaign based on their requirements. Take a look at some common setups we regularly face with our clients. It should give you an idea of what you are up against. Google AdWords with click to "Call Extensions" and ""Get Directions" based within 15km of Store Radius. Heavily targeted Google Adwords campaign featuring brand, competitor, and product/service based keywords.